This is the third of a five-part series on my experiences and observations of the 58th Inauguration for President of the United States. 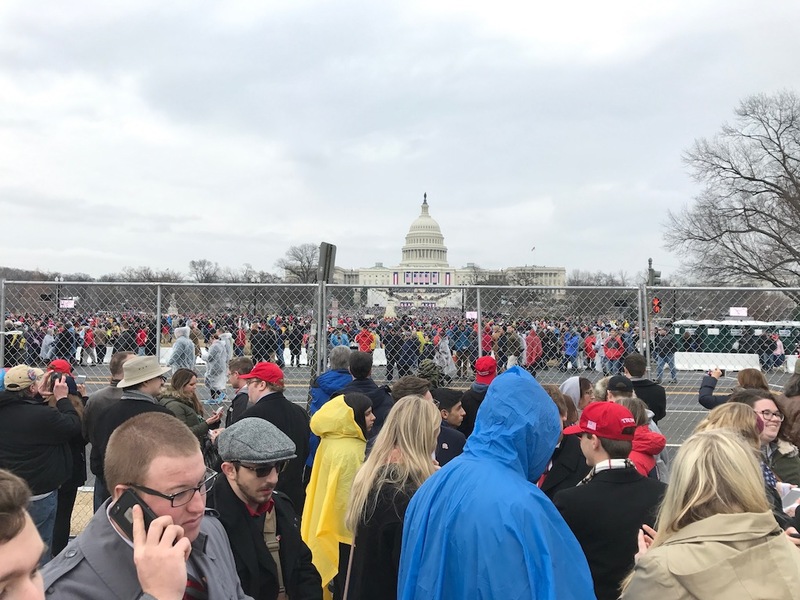 The other posts will be: Good intent gone very wrong | Escape from D.C.
On Friday during the Inauguration, everywhere you looked was definitely a sea of red from all the signature “Make America Great Again” hats that seemed to be everywhere. Every street vendor that could setup shop had booths full of red #MAGA hats and pro-Trump paraphernalia. Overall people seemed to wear a lot of red, white and blue in general. Of course with the threat of rain and and off and on drizzle that started as soon as the President was sworn in, rain-jackets and hoods also were prevalent, But once the the time got around to the parade start time, the rain had let up and the sea of red hats was flowing all over the place. In just one day however, the red gave way to an ocean of pink as the Women’s march infiltrated the city and took over every sidewalk, intersection and even road that people and emergency vehicles were trying to navigate on. Not many who wore their Red hats on Friday were wearing them on Saturday and I can’t say I blame them. The reality was that regardless of how the march was promoted, it turned into an ugly and vile anti-Trump protest. I was in one establishment where a man and his wife were about to walk outside while I was standing by the door. I noticed he had a Trump hat on, so I made sure to say to him “be careful buddy”. His wife looked at me, looked at him and then looked outside. She nervously asked me “is it that bad?”. I knew they had been inside this place for a while since it was a museum and the crowds outside had grown substantially in the last hour, so I responded with “yes its getting pretty bad, it ain’t worth it”. He nodded a thanks to me, took his hat off and then they walked outside. So sad that on election day, hundreds of thousands of Trump supporters sat quietly by as those in attendance who liked President Obama or Hillary Clinton applauded as they were announced with no fear of being harassed, but just 24 hours later those who were in the city to celebrate the inauguration of our 45th President could not feel comfortable and safe to show their support. Isn’t the left “supposed” to be the only side that believes in co-existing, tolerance, and acceptance? Well that is the narrative that many want you to believe anyway, because from everything that I have seen over the years it appears that the right and middle are much more tolerant and open-minded than the left can ever be.